The house which is the base of YogaOnCrete came into our family's hands in the late 80s, was renovated by its interior designer owners, and has thereafter frequently hosted family and friends for holidays. In 2006, the owners' daughter, Eugenia, decided to give this place a new spirit, and use it to host the first yoga course. Along with the yoga courses, she was hosting people who were to become friends, as well as her love for yoga and a life inspired by the principles of yoga. 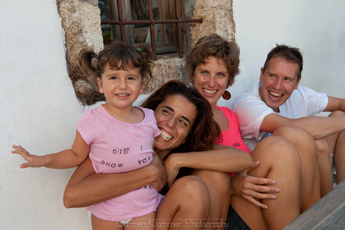 Over the years, the YogaOnCrete team has grown. It is this team that gives life to the - physical and metaphorical – space, which supports the practice of techniques that encourage the emergence of one's authentic self and the joy that stems from the connection with our true essence. Each member of the YogaOnCrete team has made their own personal journey and search, along with academic graduate and post-graduate studies in different subjects (sport psychology, clinical psychology, psychoanalysis, finance, journalism, dance, fine arts). Combined, these journeys make up a colourful art-work of experience and knowledge. The yoga, dance and capoeira teachers, the massage therapist, the hiking guide, the chef, and the helping staff, are all professional at what we do. We share a deep desire to serve and love for our respective subjects, which are for most of us practices that have proven invaluable in our own experience and have helped us immensely in our own self-growth, which is why we are passionate about sharing them. While we respect the value of the service we offer and take it very seriously, we recognize that, especially nowadays, people have a deep need for simple, true connection and communication, in which laughter and a lightness of spirit can work wonders. Many say, that being on a holiday here feels more as if we have invited friends round for a holiday. And this is the one characteristic of YogaOnCrete that we value most and want to keep intact: the feeling that you are welcome, as part of a group of people of varied backgrounds but essentially very similar to you, and that we will do our best to make your experience the most precious souvenir you could ever take back home! During the summer season (June to October) we hold various courses of yoga and other holistic practices that usually last a week. Individual travellers can join and either stay in a shared or single room. Additionally, we offer B&B outside pre-scheduled course dates, and are also open to drop-ins during the courses, subject to availability. The house, outdoor yoga platform and studio at YogaOnCrete can also be rented for a private group, or by a teacher to host a yoga or other holistic practice retreat or holiday, and practice, learn and grow in a stunning location, with the care of our on site staff. "When going into Eugenia's idyllic house-retreat, you have to go through a beautiful elementary school... Even if she tried, she couldn't have picked a better location. Going through the programme of a course, is like entering an elementary school. Only this time it is for learnig to breathe, to love, to be (and to eat Joshua's delicacies!)" Other things people say about us!